Owls are a group of birds of prey. Most are solitary and nocturnal, with some exceptions (e.g. the Burrowing Owl). They are classified in the order Strigiformes, in which there are over 200 extant species. Owls mostly hunt small mammals, insects, and other birds, though a few species specialize in hunting fish. They are found in all regions of the Earth except Antarctica, most of Greenland, and some remote islands. Though owls are typically solitary, the literary collective noun for a group of owls is a parliament. The living owls are divided into two families: the typical owls, Strigidae, and the barn-owls, Tytonidae. A horned owl, genus bubo. Owls have large forward-facing eyes and ears, a hawk-like beak, and usually a conspicuous circle of feathers around each eye called a facial disc. Although owls have binocular vision, their large eyes are fixed in their sockets, as with other birds, and they must turn their entire head to change views. Owls are far-sighted, and are unable to clearly see anything within a few inches of their eyes. Their far vision, particularly in low light, is incredibly good, and they can turn their head 135 degrees in either direction; they can thus look behind their own shoulders. It is not correct, however, that they can turn the head so far as to face completely backwards. Different species of owls make different sounds; the wide range of calls aids owl species in finding mates or announcing their presence to potential competitors, and ornithologists and birders in locating these birds and recognizing species. The facial disc helps to funnel the sound of prey to their ears. In many species, these are placed asymmetrically, for better directional location (Norberg, 1977). Most owls are nocturnal, actively hunting for prey only under cover of darkness. Several types of owl, however, are crepuscular, or active during the twilight hours of dawn and dusk; one example is the pygmy owl (Glaucidium). A few owls are also active during the day; examples are the Burrowing Owl (Speotyto cunicularia) and the Short-eared Owl (Asio flammeus). 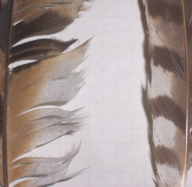 Comparison of an owl (left) and hawk (right) remex. Much of the owl's hunting strategy depends on stealth and surprise. Owls have at least two adaptations that aid them in achieving stealth. First, the dull coloration of an owl's feathers can render them almost invisible under certain conditions. Secondly, the owl's remiges, or flight feathers, have fluffy trailing edges, muffling the owl's wingbeats and allowing its flight to be practically silent. Some fish-eating owls, which have no need of silence, lack this adaptation. Elf owls also lack the feathers for silent flying. Once prey has been captured, the owl's sharp beak and powerful clawed feet allow it to tear the food to pieces before eating, even though most items are swallowed whole. Scientists studying the diets of owls are helped by their habit of regurgitating the indigestible parts of their prey (bones, scales, fur, etc.) in the form of pellets. These "owl pellets" are often sold by companies to schools to be dissected by students as a lesson in biology and ecology, because they are plentiful and easy to interpret. Owl eggs are white and almost spherical, and range in number from a few to a dozen, depending on species. Their nests are crudely built and may be in trees, underground burrows, or in barns and caves. The smallest owl is the Elf Owl (Micrathene whitneyi), at as little as 31 g (1.1 oz) and 13.5 cm (5.3 inches). Some of the pygmy owls are scarcely larger. The largest owls are the two of the eagle owls, the Eurasian Eagle Owl (Bubo bubo) and Blakiston's Fish Owl (Bubo blakistoni), which may reach a size of 76.2 cm (30 in) long, have a wingspan of just over 2 m (6.6 ft), and weigh of nearly 4.5 kg (10 lb). The systematic placement of owls is disputed. 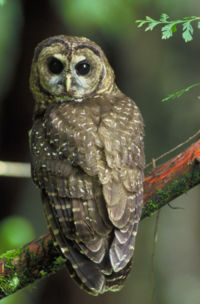 For example, the Sibley-Ahlquist taxonomy finds that, based on DNA-DNA hybridization, owls are more closely related to the nightjars and their allies (Caprimulgiformes) than to the diurnal predators in the order Falconiformes; consequently, the Caprimulgiformes are placed in the Strigidae and the owls in general become a family Strigidae. This is not supported by more recent research. In any case, the relationships of the Caprimulgiformes, the owls, the falcons and the accipitrid raptors are not resolved to satisfaction; currently there is an increasing trend to consider each group (with the possible exception of the accipitrids) a distinct order. There are some 225 extant species of owls, which are subdivided into two families; typical owls (Strigidae) and barn-owls (Tytonidae). Some entirely extinct families have also been erected based on fossil remains; these differ much from modern owls in being less specialized or specialized in a very different way (such as the terrestrial Sophiornithidae). The Early Paleocene (c.58 mya) genus Ogygoptynx can be taken to indicate that owls were present as a distinct lineage already at the extinction of the non-avian dinosaurs, making them one of the oldest known groups of non- Galloanserae landbirds. The supposed "Cretaceous owl" Bradycneme is a non-avian dinosaur however, possibly Elopteryx. During the Paleogene, the Strigiformes radiated into ecological niches now mostly filled by other groups of birds. The owls as we know them today, on the other hand, evolved their characteristic morphology and adaptations during that time too. By the early Neogene, the other lineages had been displaced by other bird orders, leaving only barn-owls and typical owls. The latter at that time were usually a fairly generic type of (probably earless) owl similar to today's North American Spotted Owl or the European Tawny Owl; the diversity in size and ecology found in typical owls today developed only subsequently. Around the Paleogene-Neogene boundary (some 25 mya), barn-owls were the dominant group of owls in southern Europe and adjacent Asia at least; the distribution of fossil and present-day owl lineages indicates that their decline is contemporary with the evolution of the different major lineages of typical owls, which for the most part seems to have taken place in Eurasia. In the Americas, there was rather an expansion of immigrant lineages of ancestral typical owls. The supposed fossil herons "Ardea" perplexa (Middle Miocene of Sansan, France) and "Ardea" lignitum (Late Pliocene of Germany) were more probably owls; the latter was apparently close to the modern genus Bubo. Judging from this, the Late Miocene remains from France described as "Ardea" aureliensis should also be restudied. (Olson 1985:131, 267) The Messelasturidae, some of which were initially believed to be basal Strigiformes, are now generally accepted to be diurnal birds of prey showing some convergent evolution towards owls. For fossil species and paleosubspecies, see the genus and species articles. Genus Berruornis (Late Paleocene of France) - basal? Sophornithidae? Genus Palaeoglaux (Middle - Late Eocene of WC Europe) - own family Palaeoglaucidae or Strigidae? Palaeobyas (Late Eocene/Early Oligocene of Quercy, France) - Tytonidae? Sophiornithidae? Palaeotyto (Late Eocene/Early Oligocene of Quercy, France) - Tytonidae? Sophiornithidae? In many parts of the world, owls have been associated with death and misfortune, likely due to their nocturnal activity and common screeching call. However, owls have also been associated with wisdom and prosperity as a result of frequently being companion animals for goddesses. 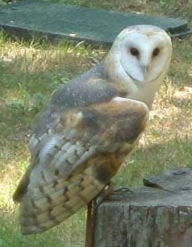 Henry David Thoreau summarized one perception of owls, when he wrote in 1854's Walden, "I rejoice that there are owls. Let them do the idiotic and maniacal hooting for men. It is a sound admirably suited to swamps and twilight woods which no day illustrates, suggesting a vast and underdeveloped nature which men have not recognized. They represent the stark twilight and unsatisfied thoughts which all [men] have." Ancient Egyptians used a representation of an owl for their hieroglyph for the sound m, although they would often draw this hieroglyph with its legs broken to keep this bird of prey from coming to life..
A Burrowing Owl, Athene cunicularia. In the culture of many Native Americans, (e.g. the Native American Hopi nation), taboos often surround owls and they are often associated with evil or sorcery. Like eagle feathers, the possession of owl feathers as religious objects is regulated by federal law (e.g. The Migratory Bird Treaty Act of 1918 and Title 50 Part 22 Code of Federal Regulations). The Aztecs and Mayans, along with other natives of Mesoamerica, considered the Owl a symbol of death and destruction. In fact, the Aztec god of death, Mictlantecuhtli, was often depicted with owls. There is a saying in Spanish that still exists today: cuando el tecolote canta, el indio se muere ("when the owl cries/sings, the Indian dies"). Other Native American Tribes saw the owl as the carrier of the elders' spirits. In Japanese culture, owls are seen as either negative or positive symbols depending on species. Owls are seen as divine messengers of the gods while Barn or Horned owls are perceived as demonic figures. In Indian culture, a white owl is considered a companion of the goddess of wealth, and therefore a harbinger of prosperity. The owl has been adapted as an emblem to reflect its implications of wisdom (Wise old owl) by a revered military institution in India known as the Defence Service Staff College. In colloquial use, however, it is commonly used to refer to stupidity. The demoness Lilith is thought to have been associated with (screech) owls as well, by way of the KJV translation of the passage in Isaiah 34:14. Prior to the rise of Islam, owls were considered bad omens and associated with evil spirits in most Middle Eastern pagan traditions. In modern times, although such superstitions are less prevalent, owls are still popularly considered "evil" because of their fierce, horrific appearance. In Greek mythology, the owl, and specifically the Little Owl, was often associated with the goddess Athena, a bird goddess who became associated with wisdom, the arts, and skills, and as a result, owls also became associated with wisdom. They are the unofficial mascot of the high-IQ society Mensa. The Romans, in addition to having borrowed the Greek associations of the owl (see Owl of Minerva), also considered owls to be funerary birds, due to their nocturnal activity and often having their nests in inaccessible places. As a result, seeing an owl in the daytime was considered a bad omen. The vampiric strix of Roman mythology was in part based on the owl. Likewise, in Romanian culture, the mournful call of an owl is thought to predict the death of somebody living in the neighbourhood. Such superstitions caused a minor disturbance when an owl showed up at Romanian President's residence, Cotroceni Palace. In the Welsh Cycles of the Mabinogion, the Owl is considered cursed - the first owl was Blodeuedd, a woman born of flowers to be the wife of Lleu Llaw Gyffes. Because she fell in love with another man and plotted to kill Lleu, Lleu's guardian Gwydion turned her into the first owl, saying "You are never to show your face to the light of day, rather you shall fear other birds; they will be hostile to you, and it will be their nature to maul and molest you wherever they find you. You will not lose your name but always be called Blodeuwedd." The addition of the w in her name changed her from a woman of flowers to an owl. In Finland the owl is paradoxically viewed as both a symbol of wisdom, and as a symbol of imbecility (presumably because of it's "dumb" stare).